February 17, 2013 -- Steve Torrence’s season got off to a good start Sunday with an extremely close victory over Spencer Massey in the opening round of the 53rd O’Reilly Auto Parts NHRA Winternationals at Pomona Raceway. The margin was the result of Torrence’s .034-second reaction time. 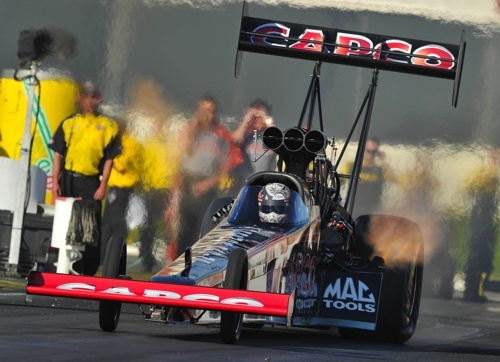 The Torrence Racing/Capco Contractors dragster went straight down the 1,000-foot track in 3.787 seconds at 322.81 mph to Massey’s .060 light and a time of 3.763 at 326.23 mph. Torrence also watched Antron Brown’s accident that destroyed his Top Fuel car. Brown escaped with no major injuries, but it took 90 minutes before the track was ready for Torrence to race Tony Schumacher. “Any time you are racing Tony Schumacher and the U.S. Army car, you know they are very good, but I knew we had car that could run with them,” commented Torrence. Torrence left the line before Schumacher but he couldn’t hold off his rival’s 3.756-second, 322.19 mph lap. Torrence followed close behind with a 3.782 at 324.82.